Don’t get too eager to go put an all-new Volkswagen Tiguan, introduced this past week at the Frankfurt Motor Show, in your driveway. You won’t find this new utility vehicle at dealerships this month, this year, or possibly even next year (very late calendar-year 2016 or early 2017 is its anticipated U.S. on-sale date). That model changeover can’t come soon enough, as the new 2018 Volkswagen Tiguan will finally give VW a foothold in one of the most important segments of the vehicle market—that of the Honda CR-V, Toyota RAV4, Ford Escape, and Subaru Forester, among others. For the current Tiguan, VW hasn’t consistently sold more than 30,000 units annually. That’s just a tenth of the annual sales of the Honda CR-V, and also a small fraction of Toyota RAV4, Ford Escape, or Subaru Forester sales. What will bring this new Tiguan to the major leagues isn’t just a single thing. One most important improvement in the new Tiguan is that it’s now American-sized for a compact crossover; compared to the previous Tiguan, the short-wheelbase European Tiguan (shown in these pictures) is already 2.4 inches longer, with a wheelbase that’s three inches longer. But the long-wheelbase version—not to be officially shown until next year’s Paris Auto Show—has another nearly four inches of wheelbase and an available three-row seating layout. U.S. versions of the 2018 Tiguan will be assembled in Mexico, although Volkswagen might bring the short-wheelbase Tiguan to the U.S. a year or two later, in a high-performance ‘R’ model (as hinted by the sportier ‘R-Line’ trim of one of the Frankfurt show vehicles).. The 2018 Volkswagen Tiguan will be powered by VW’s familiar 2.0-liter TDI turbo-diesel four-cylinder engine, as well as a version of the turbocharged, direct-injected Miller-cycle 2.0-liter four that powers the new Audi A4 (making 188 hp in that model). “It’s a very efficient combustion system,” said Neusser. VW says that fuel economy of this engine line is up 24 percent versus the previous engines; while the current Tiguan achieves just 21 mpg city, 26 highway (23 combined), expect the new model to achieve at least 30 mpg on the highway. The Tiguan will offer a choice between front-wheel and all-wheel drive, and will have the Haldex 5 system that’s used in a wide range of models from the high-performance Golf R to the Audi Q3 crossover. Yet a new multi-mode control system will provide settings for tackling off-road conditions. Although the rather upright, chiseled stance can be a bit misleading at first glance, the new Tiguan is both slightly lower and more aerodynamic than its predecessor. And VW has worked hard to preserve both the classic proportions of a utility vehicle—with short overhangs—and stayed away from a design that’s too carlike or curvaceous on the outside. This is a direction that the brand will keep on all of its mainstream utility vehicles, Neusser confirmed. Neither the Tiguan nor the upcoming larger three-row crossover are overly carlike or curvaceous. 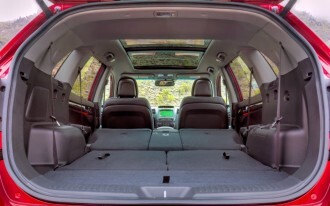 “Volkswagen SUVs are high seaters,” he said, pointing to the command seating position, good outward visibility, and ability to tacklerough street and pavement surfaces. The Passat, Jetta, Tiguan, and its larger yet-unnamed larger SUV are the core pillars of the U.S., moving forward, Neusser confirmed, and you can expect many powertrain variants of each of these models—quite an about-face versus the current Tiguan and its limited, single-powertrain availability. 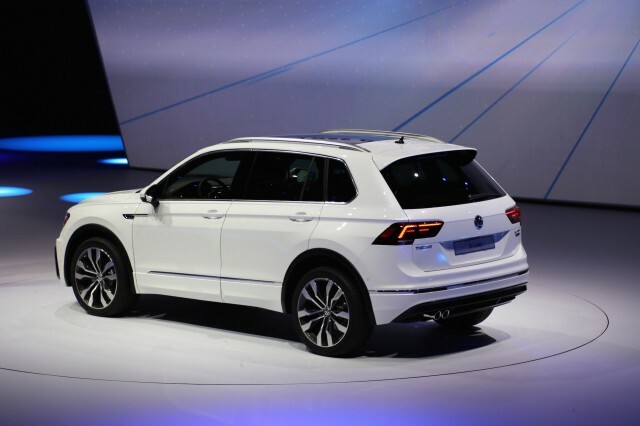 Gasoline versions of the Tiguan are expected to launch by early 2017, while a Tiguan GTE plug-in hybrid model would arrive about a year after launch, Neusser confirmed. Meanwhile, the Tiguan will be a far better family vehicle than its predecessor, with most of its additional wheelbase going to second-row legroom, plus a low cargo floor and sliding second row (allowing 7.1 inches of travel) plus available third-row, seven-passenger flexibility. Those third-row seats, as we saw, are very small. But it could prove an important selling point in its class, as the Mitsubishi Outlander and Nissan Rogue are among just a few others this size to offer it. 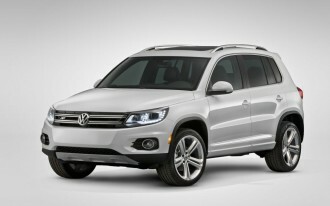 And if you’re willing to wait an additional year beyond those gas and diesel models, you could plug in with the Tiguan. 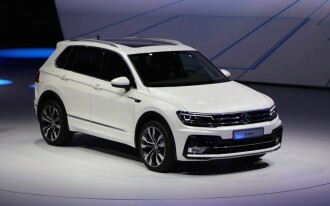 VW also gave first details for the Tiguan GTE, a plug-in hybrid version that can go around 30 miles in all-electric mode. The borrows from the same toolkit used in the Audi A3 e-tron and (Europe-only) Volkswagen GTE, with a 1.4-liter turbocharged TSI four-cylinder engine and a version of the automaker’s DSG dual-clutch automatic with an integrated electric motor—and, in this case, a 13.0-kWh lithium-ion battery pack. The GTE is able to accelerate to 60 mph in around eight seconds, and as with VW’s entire line of plug-in hybrids in the works, it will allow Level 3 fast-charging, an extra go-green convenience that could give most of a full charge back in 20 or 30 minutes. We’ll have more details on the U.S.-spec 2018 Tiguan in fall 2016, a few months before it goes on sale.